Though it has been many months since Denver, Colorado trio, Edison, (Sarah Slaton, Guitar, Vocals; Maxwell Hughes, Guitar, Vocals; Dustin Morris, Mandolin, Trumpet, Percussion, Harmonica) graced the listening public with new music, the famously wandering band in a van has not been aimlessly raking fretbridges or fingerboards during all that time. No, since the release of full length album Familiar Spirit (Rhyme and Reason Records, 2016), Edison actually came into quite the inspired batch of new musical ideas not too long after its fledgling debut album. Stalled only by the bureaucratic idiosyncrasies of predetermined business arrangements, knowing that Edison’s previously silenced songs are now free to fill the air around ears and in lungs everywhere, is celebratory in and of itself. Arriving 31 August 2018, thanks to a more than successful crowdfunding campaign hosted via Indiegogo, Edison’s many fans from miles far and wide wait with bated and perhaps bittersweet breath, for what will be the band’s next but ultimately last project in the Lion’s Heart EP. While listeners oscillate between excitement and a mild sense of sadness, for the moment, the needle can swing in a decidedly happy direction with the debut of “Take Me Home,” the first single from the upcoming extended play. Check out the stream below and whet those musical appetites! Our new music is going pretty far from folk. Y’all ok with that? If that past feeler of a query was meant as gospel, listening now, it makes plenty of sense. 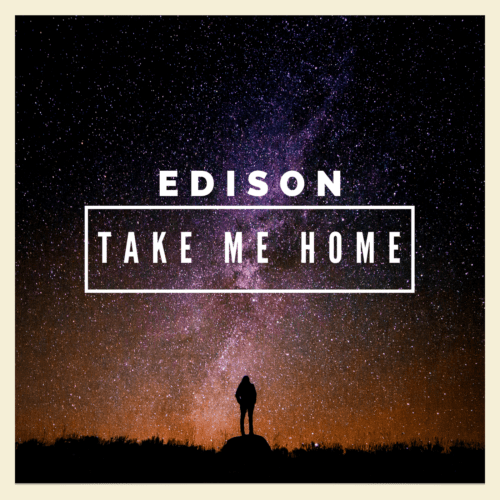 Indeed, “Take Me Home” is a display in Edison taking musical liberties that move notably outside and away from the lines of the indie folk foundations that would come to make Edison instantly recognizable. And to a degree, understanding that this will in fact be the closing chapter of the band, it must be refreshing for Slaton, Hughes, and Morris to know they can embrace the stretched sounds without needing to account for long-term artistic plans or label backlash. Yet, the shifts here aren’t so drastic that listeners need fear the group flying off to a distant sonic realm completely disconnected from what’s come before. Recalling tracks like “Water in the Well” from Familiar Spirit, the slightly less organically dressed effectual ornamentation introduced back then makes the decisively less acoustic nature of “Take Me Home” less of an out-of-left-field swing and more like a semi-expected progression, even if took a while to surface again. Where Edison thrived on open sound stages, acoustic instrumentation, and an inherently human (and thus, subsequently imperfectly quirky) quality, “Take Me Home” showcases an intent towards aural finesse, such that’s immediately revealed with the gracefully smoothed and flourished triple hand clap that sets the song in motion. Still, by virtue of the very inclusion of said claps, and having them dressed from a naturally sourced action rather than plucked out of a digital library to start, shows the organic and folk-fueled spirit of Edison’s sound still drives the car (or should that be van?). The prominence of a bass guitar part throughout the very hook-oriented song is another ingredient not native to the recipe of Edison but one that when included here – much like the occasional inclusion in fellow acoustically driven progressive folk group, Nickel Creek – doesn’t take away from any of the band’s existing chemistry in execution, whether individually or as a unit. Its pairing with an evenly hit hi-hat, which is also continuous and mixed high throughout the song, adds power to the rhythmic engine of “Take Me Home,” and steers the music in a very specific direction. Alternating between longer, steady beats and rapid, almost jittery, beats in the verses and chorus respectively, the coexisting prominence of the light but fast percussion with the slower but larger toned bass creates a perfect storm for driving audiences to dance because dynamically solid but tempo-variant sounds fall on nearly every count. This choice of rhythmic framework is applaudably clever because Edison managed to find a way to craft another engaging, upbeat song like their hits “Open Road,” and “The Good Fight,” without resorting to either the band’s previously favored tom and kick-centric downbeat rudder or, the current mainstream methodology using layers of digital synthesizer tones. The interweaving of Edison’s more signature and less common arrangement elements, like Morris’s trumpet, doubling along side an electrified guitar playing shared notes but with a western-tinged bent twist, (perhaps a nod to how much time Edison has spent in the deserts of the U.S.) encourages playbacks and listener double takes. The sounds flow together like a slickly mixed secondary color. Digesting the song from its lyric structure and depth, aside from the more amplified and production-minded aesthetic, the previously mentioned hook-oriented vantage point of “Take Me Home” is really the most distinct way Edison have taken up a different compositional mantle. Though a track like “Civil War” focused heavily on a succinct and repetitious call-and-response style chorus, its instrumental negative space and the conceptual implication of severe emotional uncertainty fit with the idea of correspondingly minimal but powerful thoughts and questions. Here now, Slaton’s recitations on “Take Me Home” are similarly repetitious but the song diverts itself from the kind of emotionally weighty counterbalance to explain the song in any way other than deliberately hook-oriented. Baby, won’t you be my baby? Come right here and take me? There’s a generality to it all, with the inference of romantic and sexual tension between two people but their genders and degree of commitment left ambiguous and flexible for interpretation and self-internalization. The bottom line: It’s an open wild card for a range of sync placement opportunities across other forms of media. “Take Me Home” is a dance-minded, audience rousing number and though the trio used new, less-acoustic means to encourage such, the entire premise of the band playing to a crowded and actively engaged room of people is, again, an all-too-familiar scene for Edison. A group that has played everything from broken down dive bars to most iconic of grand arenas, in any setting, the fire propelling Edison’s shows and what became their sound set to record, has always been the growing communities encountered over the course of the trio’s many, many tours. Thus, for what at first might seem like an artistic dilution and deviation from the more intimate and narrative-concentrated material which inspired Edison way back when, is actually a rather genuine callback to what, and more importantly who, the group has always valued: the people who hear the music and the way it makes them feel. Perhaps one aspect of listening to “Take Me Home” that’s most difficult to accept, is hearing the changes in new material like this and resisting the urge to reach out for implications of a future that isn’t meant to be, even as such thoughts fly by like numerous but elusive lightning bugs at the arrival of dusk and inevitable onset of darkness. “Take Me Home” will be available tomorrow, 3 August 2018. Find it on iTunes, Bandcamp, and streaming on Spotify. Lion’s Heart EP arrives on 31 August 2018. “Take Me Home” was engineered by Andrew Berlin (Rise Against, the Flobots), at The Blasting Room Studios. Catch Edison during a last batch of shows, primarily in the midwest, through September. Full tour list and tickets HERE.